Hi Everyone! I'm Leo Notenboom from askleo.com coming to you today from the palatial travel trailer where I often do many of the AnswerCast recordings. It actually has a nice, not too echo-y feel to it based on the internals. It's basically a good, portable recording studio. Although today you may hear a little bit of wind in the background since we're actually in the middle of a little bit of a windstorm. 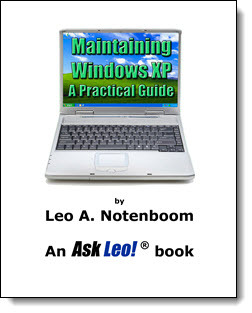 So, over the past couple of months, I'd say that Windows XP related questions, most boiling down to "What do I do about Windows XP support ending this coming April? ", have been very common. I want to go over what some of my suggestions are; what you need to do depending on your situation to deal with the end of life of Windows XP. I read many articles (including some on Ask Leo!) that recommend that people should change their passwords from time to time. But what is good practice in this respect? Should it be related to frequency of use? For instance, some passwords are used frequently, some less often, and some rarely. Or should it be related to the level of security needed? For instance, passwords for online banking are more sensitive than passwords for magazine subscriptions. Good practice in a corporate environment seems to be to force network and other password changes every 30 days or so. This would seem to be overkill in the home environment as it could result in some accounts being accessed more often to change a password than to do anything else. Unless you get into a good routine, like when you do data backups, password changes will only get done sporadically, if at all. As you say, routines for things like this are difficult to set up, and if not automated, they are easily forgotten. Automation may be the answer in many cases, but it's not always available – at least not in a convenient form. But before we even get to that, I want to talk about that "change your password periodically" rule of thumb. I've changed my mind on it. Do your changes to Chrome mysteriously disappear or do strange sounds come out of your speakers? Wondering how to mix SSD and HD hard drives or what hackers might do to your anti-virus program? Wish you could get software on CD? All that and more in this Answercast from Ask Leo! Continue reading: How do I make a change to Chrome that sticks? Software vendors seem to think these days that everyone has high speed internet for downloading large files. What happens if you don't? Continue reading: Why can't I get software on CDs or DVDs? Continue reading: Why am I getting unexpected adult audio on my church computer? Once a hacker has control of your machine they can do anything they want. So yes, they will try to disable your anti-malware... and more! Continue reading: Can malware authors hijack my anti-malware software? Continue reading: How should I use my SSD and HD together? Administrator accounts have more safety functions in them in recent Windows versions, but you're right... running as an administrator could be a risk. Continue reading: How do I stay protected using an administrator account? It's mind-boggling to me that systems such as ATMs and cash registers would use Windows XP (or any commercial OS) anyway. Linux seems like a better fit for those type of applications. Now, I'm not a Windows hater; I choose it over Linux for my home computers. But the reasons to choose Windows for desktop use do not at all apply to dedicated one-application computer system such as an ATM, cash register, industrial control machine, etc. - You already need a bunch of special custom drivers, might as well write them for Linux. - You already need a special custom application, might as well write it for Linux. - You don't need a familiar or easy-to-use interface for the OS, nobody ever sees it anyway. - You already need to stand up a sustainment team of smart engineers to support the product, that won't change by using a commercial OS. Free OS updates will offer you savings that you then spend trying to fix your application, which breaks after each OS update. - When your OS support goes away, there is no panic, just business as usual. You are already accustomed to supporting it yourself. I would bet that Leo (and others) have the necessary background to either corroborate or poke holes in my theory. Nope I agree with you. In fact I'd take it further - I'd want my dedicated task machines to not be based on a commonly available general purpose OS to begin with. There are other operating systems that might also be a much better fit for things like banking - particularly with the added security requirements that such applications should demand. One thing that might drive selection and adoption, however, might be the available labor pool to pull from - there are probably many more Windows programmers out there than Linux, and many more of those than for any obscure OS more closely targeted to this type of task. Similarly I'm sure that there are more available development tools for Windows. I'm certainly not saying that the problem can't be solved for Linux or an obscure OS, just that it's probably easier, and cheaper, to pull from the greater pool of resources available for Windows. I am no longer surprised by the use of old technology. I have seen Garages and even Electronic stores using old DOS screen type programs to run their business (even have seen a few that still use those old monochrome monitors). If it works, why invest in new software? If the hardware breaks down, they can still usually run on newer systems in compatibility mode. I understand that banks are a little different animal, but many companies only want to keep using what they know - they aren't IT people and don't really care that much about the aspects of security that they don't understand. Big companies don't want to go through the cost and hassle to upgrade all of their machines, and Mom and Pop small businesses see no reason to invest in newer software. We finally upgraded our Office from 97 to 2007 last year (around 500 computers). For most is was just a training issue and they were happy, some we couldn't upgrade because they had software that wouldn't work with newer versions - but just about everybody complained at first! Upgrades are hardly ever as easy or go as smooth as expected. One of the things that Amazon.com does is to really encourage comments on purchases. That keeps the comment volume high and helps dilute spam attempts as well. It's so sad to really contemplate how spamming has hurt small businesses in so many ways. Really makes it tough for local businesses. I was helping a friend the other day with some Windows 8 issues and a not-uncommon question came up, one that I often dread. As in, "Why did they do that?" It's a common question that gets applied to computers and software of all generations and iterations. Windows 8 has generated a healthy share of why questions, but trust me, it's nothing new at all. The problem is that asking why is more often than not an exercise in futility. Continue Reading: Why ask why?